Ned Stark could be brought back from the dead if the Night King comes to Winterfell and resurrects the fallen. It seems like there is still an eternity left before the new season of "Game of Thrones" hits the airwaves. Since there are no new episodes to watch, it means that fans have had a lot of time on their hands since last season ended. This extra time has given rise to even more theories and possibilities, as fans continue to speculate on a daily basis. While many fans (even those that read the books beforehand) still can't get over the loss of Ned Stark, there is a theory circulating on Reddit that suggests that the honorable head of House Stark may make an appearance -- though not in the way that fans have been hoping for. Essentially, the theory goes that if (and when) the Night King makes it to Winterfell, he would then resurrect all those that died in that particular area. Some characters that could be resurrected may include the likes of Rickon Stark (Art Parkinson), Lyanna Stark (Aisling Franciosi), and Ned Stark (Sean Bean). According to the Reddit user (via Express): "I keep thinking about if the WW comes to Winterfell and raise the dead there (Rickon, Ned, Lyanna). I doubt it happens for a multitude of reasons, but how god**** cool would it be to see all the old favourites rise back as the enemy? Absolutely soul-crushing, but very cool." As with any theory out there, there are some detractors. When it comes to this theory in particular, the argument is being made that even if the Night King does come to Winterfell and even if he does resurrect the fallen, fans will likely not be able to recognize the characters that they've come to know and love. 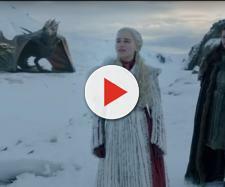 As some Reddit users have pointed out, even if said characters are resurrected by the Night King, they would be so decomposed by this point that they'd be unrecognizable. One Reddit user noted: "Ned and Lyanna have been dead so long that they wouldn't be recognisable as themselves. Rickon would look like a decomposing corpse, but might be recognisable." Taking all of this into consideration, even if the corpse of Sean Bean were to return to Winterfell, this would not be the type of reunion that most fans would want to see. Express also points out that it is unlikely that Sean Bean would want to return in this particular fashion -- even as a cameo. Either way, this leaves more for "Game of Thrones" fans to ponder as the long wait for the new season continues.